Every parent knows the truth behind the adage "the days are long, but the years are short," as we seem to only blink before our babies are toddlers, then school bound, then holding us at arm's length. Childhood is to be cherished, and with this sentiment in mind designer and CEO/Founder of Naaya by Moonlight Chaandni Singh has created an exquisite collection of organic quilts and organic blankets for babies and little ones that provide a sweet, soft landing and a warm embrace for children who are sure to cling to them as their treasured lovies during the most fleeting, precious time of life. When Singh’s son was born in 2009, her long held dream of creating her own line of quilts took flight. Naaya is her son’s name, Ayaan, spelled backwards and Chaandni translates to “moonlight” in Sanskrit. The Naaya by Moonlight collection not only bears the mother/son namesake, it’s also quite evident that the family’s heart is in every stitch of the blankets and quilts. Available in four simple, sweet and elegant designs: elephant, whale, giraffe and owl, each animal shape was hand carved onto a wooden block to create a stamp which in turn was used to create the pattern to be transferred to the quilts and blankets via the ancient, time-consuming art of block printing. Every quilt and blanket is hand quilted in India and is totally unique and one-of-a-kind. Naaya by Moonlight organic quilts are lightweight and cozy, and designed to keep kids warm in winter and cool in the summer. They feature an adorable coordinating design on their reverse, and they are the perfect extra layer to tuck your child into bed with during colder months. Naaya by Moonlight organic blankets are comprised of three layers of organic cotton with sheer cotton voile on both sides, and they have a beautiful contrasting border that makes the subtle animal designs pop. All are packaged in a reusable tote/pouch. Any piece from the Naaya by Moonlight collection would make a lovely gift for your own child or for a friend or loved one’s child. Their heirloom quality and classic design mean they may be enjoyed for generations… and many moons. When Singh's son was born in 2009, her long held dream of creating her own line of quilts took flight. Naaya is her son's name, Ayaan, spelled backwards and Chaandni translates to "moonlight" in Sanskrit. 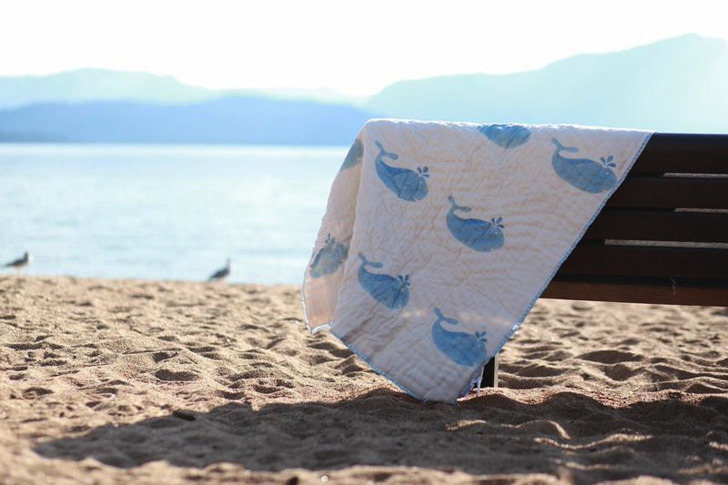 The Naaya by Moonlight collection not only bears the mother/son namesake, it's also quite evident that the family's heart is in every stitch of the blankets and quilts. Available in four simple, sweet and elegant designs: elephant, whale, giraffe and owl, each animal shape was hand carved onto a wooden block to create a stamp which in turn was used to create the pattern to be transferred to the quilts and blankets via the ancient, time-consuming art of block printing. Every quilt and blanket is hand quilted in India and is totally unique and one-of-a-kind. Naaya by Moonlight organic quilts are lightweight and cozy, and designed to keep kids warm in winter and cool in the summer. They feature an adorable coordinating design on their reverse, and they are the perfect extra layer to tuck your child into bed with during colder months. 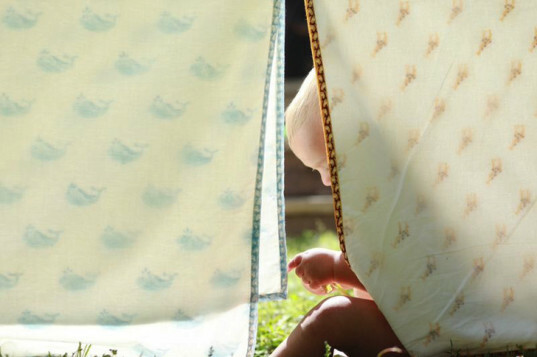 Naaya by Moonlight organic blankets are comprised of three layers of organic cotton with sheer cotton voile on both sides, and they have a beautiful contrasting border that makes the subtle animal designs pop. All are packaged in a reusable tote/pouch. Any piece from the Naaya by Moonlight collection would make a lovely gift for your own child or for a friend or loved one's child. Their heirloom quality and classic design mean they may be enjoyed for generations... and many moons.